As your spindle repair vendor our commitment to you doesn’t stop with providing the best spindle repair possible. We also have an obligation to help you keep that spindle running as long as possible. There is no faster way to end a spindles life than a “crash”. In an effort to help our customers avoid premature failure from a crash HST is offering the powerful NCPlot software at no charge with every spindle repair over $3000*. 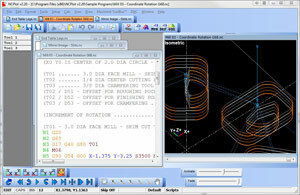 Besides being a powerful CNC programming tool, this program will allow you to verify tool path and avoid costly crashes. Software alone will not prevent spindle damage. But properly applied it can be a useful tool in preventing damage that results from tool path errors. And it is one more way that the HST Team supports their customers. Some of the damage that might have been prevented by NC Plot is shown below. The cost to repair the spindles ranged from $6000 to $12000. If you have a 3Dconnexion device such as a SpaceNavigator™, SpaceExplorer™ or SpacePilot™, NCPlot will recognize and allow you to use this device to pan, rotate and zoom the viewport. NCPlot provides a configuration dialog that allows you to customize your 3D device. The graphics viewport in NCPlot displays the graphical representation of the programmed G-Code tool path. The viewport not only shows you if your program will work as expected, but it also provides help when the results are not what you expected. Using the dynamic pan, zoom and rotate you can quickly spot parts of the tool path that are not correct. The plot controls such as animate, step forward and step backward can then help you locate the trouble spots in the program. The viewport is a dockable toolbar that may be docked on either the left or right side of the application window. It can also be undocked from the application window and moved anywhere on your desktop. As a toolbar it may also be closed altogether. The NCPlot toolbars give you quick access to the most common functions by grouping them together as buttons. The toolbars may docked into the application window on the top, left, bottom or right side. They may also be undocked and placed anywhere on your desktop, or they may be closed altogether. The toolbars may be rearranged to your liking by clicking and dragging the control handle on the left side of each toolbar. Most of the toolbars may be customized by adding buttons or hiding buttons or even creating your own custom tools. All of our customers who have paid an invoice for a spindle repair over $3000 within 30 days of application for the software are eligible to receive the NCPlot software free of charge. If your spindle repair was less than $3000 or if payment was more than 30 days ago you can still receive a deep discount on the NCPlot software package. If you are not currently a HST customer you can still obtain the powerful NCPlot software at a very reasonable price. 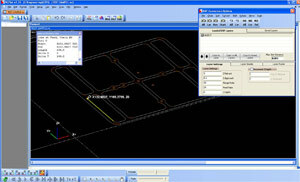 Call today for your CNC Software 1-603-483-0333.